Mumbai: The Reserve Bank of India (RBI) on Wednesday raised the interest rate ceiling on foreign currency loans in an attempt to ensure that Indian firms are able to borrow more dollar loans. In a separate move, the India central bank also raised the interest rate on deposits for non-resident Indians, or NRIs. On Wednesday, the rupee ended at 52.37 to the dollar, slightly better than the all-time low of 52.73 touched on the previous day, but lower than Tuesday’s closing level of 52.32. RBI said companies can now pay up to 350 basis points (bps) above the six-month London interbank offered rate, or Libor, for overseas loans maturing in three-five years. One basis point is one-hundredth of a percentage point. Six-month Libor is now 71 bps, which means Indian firms can pay up to 421 bps for foreign loans. This is for loans up to five years, but the rate ceiling for loans above five years remains unchanged at 500 bps above Libor. The actual cost of overseas borrowing is always more than the interest cost as the so-called all-in cost includes cost of hedging, withholding tax, etc in addition to interest. “On a review of the developments in the global financial markets and current macro-economic conditions, it has been decided, in consultation with the government of India, to modify certain aspects of the external commercial borrowings (ECB) policy," an RBI release said. RBI hiked interest rates on non-resident rupee deposits between one year and three years to 275 bps above Libor, up from 175 bps—a rate that has remained unchanged since 15 November 2008. Interest on foreign currency deposits in Indian banks has also been increased to Libor plus 125 bps from Libor plus 100 bps. The move to allow Indian firms to pay higher interest on foreign loans may have a limited impact because loan rates for Indian companies abroad are more expensive anyway, said Mohan Shenoi, treasurer at Kotak Mahindra Bank Ltd.
“Even one-year money is not available at below 400-450 bps above Libor," he said. RBI move came with a caveat—the central bank made it mandatory to bring the money immediately into the country, if raised for rupee expenditure in India. The rupee’s fall has had a widespread impact on Indian firms. Importers apart, many companies which had issued foreign currency convertible bonds (FCCBs) may face difficulties if they are not converted into equity and the debt has to be repaid. Companies which had raised FCCBs five years ago are especially likely to be hit because of the rupee depreciation. Many of them are still reluctant to hedge their currency risk because they do not want to pay the fees of buying a options contract, said forex adviser A.V. Rajwade. “Indian companies are either too greedy or they believe they can predict the future. They also do not follow the basics of risk management, which is stop-loss," Rajwade said. “Now it’s too late for these companies because hedging is based on the future and they cannot do anything about the losses they face." While some of the companies holding dollar debt have hedged their foreign currency risk, most have not done so. Indian firms extensively raised FCCBs, a quasi-debt instrument, in the bull run of 2005-07 to fund expansion. Typically, these bonds are converted into equity if the stock price of the company rises above the conversion price. If this does not happen, the issuer needs to treat the bonds as debt and redeem them. Of the 28 companies facing redemptions next fiscal year, 25 with outstanding FCCBs worth ₹ 33,000 crore face pressure, Edelweiss Securities Ltd said in a report on Wednesday. Edelweiss tracked FCCB redemptions of BSE 500 companies. “With the rupee depreciating steeply—more than 17% during FY2012—FCCB liabilities have catapulted further by ₹ 33,300 crore. Concerns loom large for companies where FCCBs are due for redemption in the near future and hence the probability of a mark to market (MTM) loss now being realised is high," the report said. MTM is an accounting practice of valuing financial assets in accordance with market value and not the value at which they are acquired. On an aggregate, unrealized cumulative MTM losses on outstanding FCCBs as of 21 November were ₹ 63,200 crore, the report said. At the peak of 2006-07, when most of these companies issued FCCBs, the rupee was trading at 40 to the dollar. With the stock market down more than 23.4% so far this year and the rupee trading at 52, paying back bond holders will be a challenge for most of these companies. “In the bull-run and with the economy doing well, around 85-90% of the companies left their currency risks unhedged. One out of every 10 companies bought a forward contract on their currency risks," said Arup Ganguly, managing partner and co-head of convertible bond sales and trading with London-based KNG Securities Llp, which tracks FCCBs of Indian companies. “Also, not many companies have overseas income to compensate for the currency losses in India." With conversion of the bonds into equity out of the question, companies are trying to find ways of paying bondholders the promised sum. According to the Edelweiss report, companies facing FCCB redemption in the next one year include Reliance Communications Ltd ($1 billion), Subex Ltd ($279 million), Orchid Chemicals and Pharmaceuticals Ltd ($175 million), Jaiprakash Power Ventures Ltd ($200 million), Rajesh Exports Ltd ($150 million), Essar Oil Ltd ($115 million), Financial Technologies Ltd ($100 million), Fortis Healthcare Ltd ($100 million), Era Infra Engineering Ltd ($75 million) and Bharat Forge Ltd ($40 million). K. Raghavendra Rao, MD of Chennai-based Orchid Chemicals, said the company “will repay the bond holders at the maturity period, which is around February 2012". Orchid’s stock is at ₹ 149, a steep discount to the conversion price of ₹ 497. “At a time when India’s rating is low and dollar shortage has gripped the world, there is a huge risk that the companies may default. 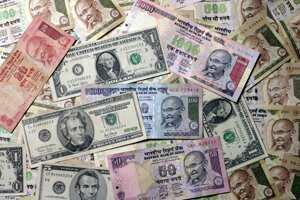 Even if they borrow in the local currency to redeem bonds, higher interest rates will pose an issue," said Subramanian Sharma, director at Mumbai-based Greenback Forex Services Pvt. Ltd.
Nimish Shah, managing director of Fortune Financial Services (India) Pvt. Ltd, said, “Most of the companies are hedged, but since the rupee has depreciated steeply the hedging costs will rise." The hedging cost is 0.5-1% of the total outstanding amount which the company pays to hedge its forex risks. “The weakening rupee will potentially increase the debt outstanding of companies affecting their debt to equity ratios. This will impact their borrowing capacity further. Clients who did not hedge their foreign currency risks are now coming to us to hedge their forex risks," said Vidya Sagar, consultant at Mecklai Financial Services Ltd.
Expectations are that the rupee will weaken further, probably to 55 per dollar by the end of the fiscal year. “It will remain under pressure because the current factors like twin deficits, lower capital inflows and slower growth will continue," risk management expert Rajwade said.